Happy is a cat with some magical power, which may be the reason for his ability to speak. He can temporarily grow wings on his back and fly, and is capable of carrying only one person in this form. Happy apparently can fly at incredible speed (As it took Eligor less than a hour to reach Clover when Happy caught up with him in mere seconds with Natsu in tow) This is also the only kind of transportation that does not make Natsu sick. When asked why, Natsu got angry and exclaimed that Happy was a friend, not a means of transportation, ironically Natsu later gets sick when Gray gives him a piggyback ride when he's injured. He's very close to Natsu and becomes friends with Lucy quickly. The three form a team at the start of the manga. 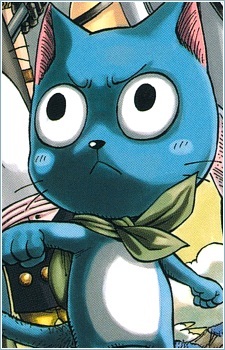 Happy is a full-fledged member of Fairy Tail, and has a member stamp on his back. It's also unknown if Happy even though being a mage and a member of Fairy Tail, can use his magic offensively or not. Happy has a very cheerful nature. Even when facing danger, he maintains a smile. Along with Lucy, he is one of the saner members of Fairy Tail and often acts as the mediator between Natsu and Gray. Happy's original name was going to be named Freyr, after a Norse god. But Hiro Mashima felt it didn't fit him, so he change the name to Happy to fit the character. Happy is actually a magical creature that comes from Edolas. These creatures are called Exceed, and are sent to Earthland to kill the Dragon Slayers. When their mission was changed to "kidnap the Dragon Slayers", Happy's memory got erased. Later it was revealed that this was not the case but that they were sent there to try to save their lives from a future foreseen by the queen of the Exceed. The "mission" was a misunderstanding by Charle who has the same ability as the queen and did not understand what her visions meant.